Across the top row and at the two bottom corners we see some of the kit parts you'd have gotten for your twenty dollars if you's purchased all three kits back in 1931. 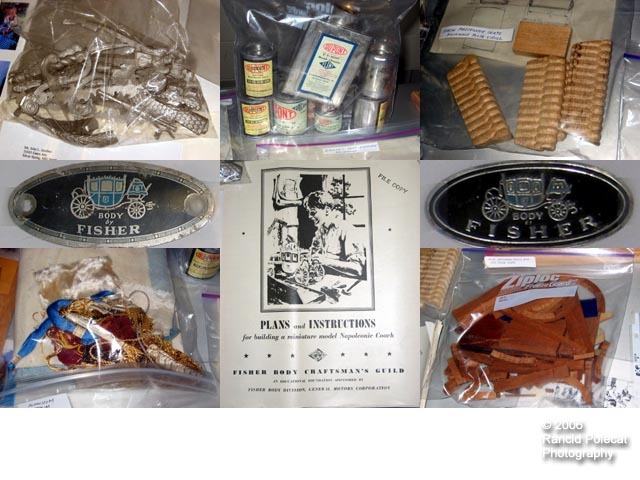 First is a bag of cast white metal decorative trim parts, nuts, bolts, pins, and nails. The trim would be attached with small nails and either painted gold or gold leafed. Next is a collection of brushable DuPont lacquer paints these included dark and light blue for the coach body, red and black for the frame, and gold for the decorative trim. In the lower left corner is a bag of upholstery materials. They supplied far more than need to complete project. The upholstery kit included fake rabbit fur for the carpeting, DuPont Fabricoid (for simulating leather in the suspension and on the footman's platform), fancy headliner and seat cover material, braid work, tassles, and more. The wood kit, parts of which are shown in the upper and lower right corners, included rough dimensioned blocks of pine, mahogany, maple, and balsa that the builder had to carve and shape. At bottom center we see the cover of the Plans and Instructions for building the Napoleonic coach to the official specifications of the Fisher Body Craftsman's Guild competition. Just in case you hadn't yet recognized the coach, the mid-level pictures on the left and right are two versions (from different eras) of the Fisher Body sill plate featuring the coach in profile.